Sunday, 17 March 2019, began clear and windy, but unforecasted clouds appeared mid-day. Monday, 18 March, also began clear and windy but unforecasted clouds once again appeared mid-day, with the sky becoming mostly cloudy by mid-afternoon. Tuesday, 19 March, dawned clear and breezy, but with a forecast for a cloudy night, which it was. Cloudy skies continued until Friday, 22 March. Slewed to the star Sirius, tweaked the alignment of both finderscopes. Then updated the TLE for the night's good pass of the International Space Station (ISS). Slewed to the star Betelgeuse and SYNCed the AutoStar on it. The star had a nice orange color against the still bright blue sky 10 minutes before sunset, 102X. Prepared the D850 DSLR for imaging. 1847 MST: slewed the 12" telescope to Sirius, mounted the D850 at prime focus + 2X Powermate, focused, and locked the 12" mirror using the ScopeStuff Mirror Lock. 1852 MST: ready for the ISS pass. Once the pass started tracking was pretty good through the first half. Unfortunately, the exposure settings I used (1/2000sec, ISO 1600) badly unexposed the video and no usable frames were captured. As the ISS passed near the North Celestial Pole the camera body began getting too close to the telescope mount base so I ended tracking at that point. Mounted the D850 DSLR at prime focus + 4X Powermate, focused on the star Rigel, and locked the mirror. I tried to image Sirius B (the "Pup Star"), but seeing was not good enough to overcome the glare from Sirius A.
I next mounted the D850 DSLR at prime focus + focal reducer, focused on Sirius, and locked the mirror. 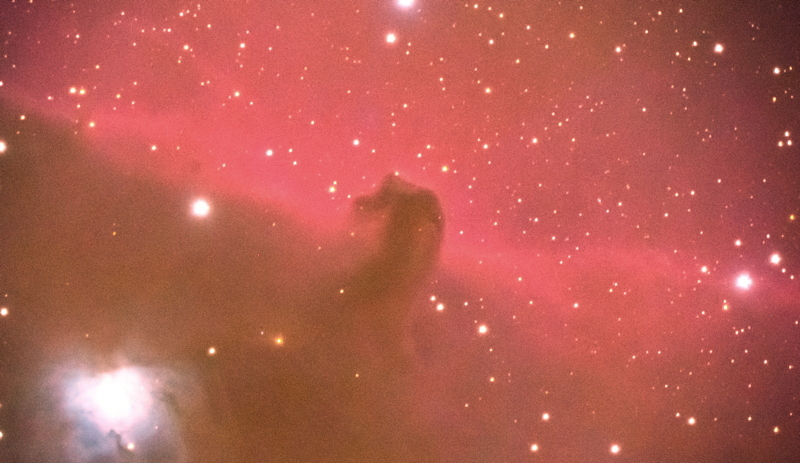 Slewed to IC434 (Horsehead Nebula). 2021 MST: High Precision OFF. 2032 MST: StarLock OFF, High Precision OFF. Removed the camera and focal reducer. The eastern sky was brightening from the soon-to-rise waning gibbous Moon. 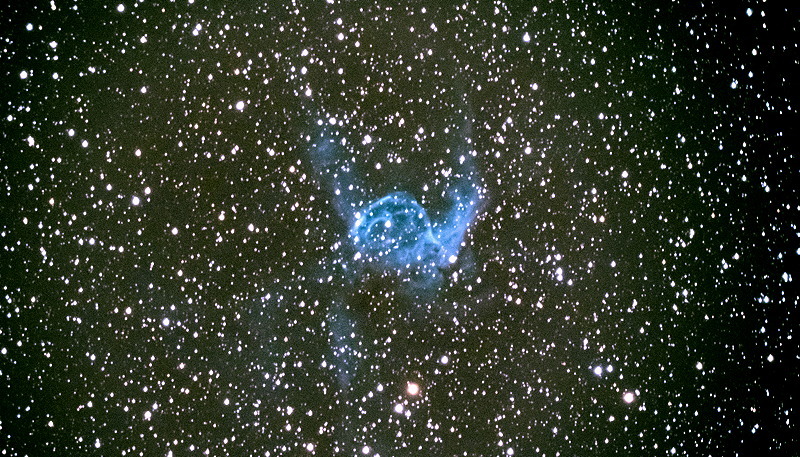 2042 MST: viewed Thor's Helmet Nebula, 102X. I then checked out the next galaxies that I would be imaging for my Extragalactic Supernova Project, 102X: NGC2613, NGC2683, NGC2681, and NGC2655. I will be a guest lecturer at the First Annual David H. Levy Arizona Dark Sky Star Party At Kartchner Caverns State Park in October 2019. Here is a short video by Scott Roberts of Explore Scientific announcing my participation.